We have quiet the challenge in our house. 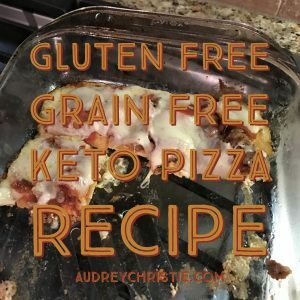 We always try to eat healthy and organic for one, but we are working it on a budget ($125 or less per week for a family of 4), and we have 2 gluten allergies plus one keto eater. Luckily all of us LOVE pizza! So that part is easy. In a small bowl, mix the “crust” ingredients well. I used a hand mixer to make sure it was mixed well. 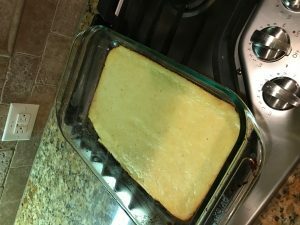 Grease the bottom and sides of a 9×13 glass baking pan with butter (or coconut oil). Spread the “crust” mixture onto the bottom of the pan. It will be about 1/3″ thick. Try tilting the pan to make it evenly distributed. Once crust is done, remove from the oven and let it sit for 15 minutes to cool. Meanwhile pre-heat oven up to 415 degrees. Next spread 4 tbsp of your sauce over the crust. Sprinkle with toppings (italian sausage, pepperoni, crumbled bacon, baby spinach). Let cool for 10 min to set, voila! My 6 year old is pretty darn picky and she chowed down! We served it with Keto Caesar Salads.